Christie Applehanz: Peace Corps a challenge, dream Columnist will spend two years in Ukraine developing businesses. Just take a hat, you'll be fine, the Peace Corps recruiter assured me. I wasn't convinced it will be that easy. I'm still not. But I bought a hat on sale at Old Navy because the Peace Corps holds a ticket to Ukraine with my name on it. And it is cold there. Long underwear and goofy hat cold. I will soon be off to a country where economic instability is the norm. Standards of living for most citizens have declined by more than 50 percent since the early 1990s. The quilt my grandmother made for me to take along is worth more than what most Ukrainians earn in a month. I canceled my cell phone contract before going to a country where it isn't unusual for people to wait up to 30 years to get a phone installed. Even then, there is no touch-tone service, and lines tend to magically disconnect. So why am I leaving my friends and family for two whole years to go to a land where toilet paper is a luxury? Of course, I am idealistic, like every other volunteer in the nearly 40-year history of the Peace Corps. We dream of changing something -- even a little -- for the better. It is a chance to live in a country at a turning point in its history. Ukraine is struggling for its own identity as it moves into just the second decade of independence from the former Soviet Union. This isn't the Peace Corps of the Kennedy kids. I won't be digging ditches or planting corn. These days, Peace Corps volunteers load up their laptops to tackle issues like economic growth in developing countries. They haven't told me exactly what I will be doing over there, although my assignment area is business development. One volunteer runs a shelter for battered women. Another helps women market their crafts. Many teach free market principles. For some reason, my wonderful mother is less than thrilled about my decision to join an organization that brags, "Only three volunteers have ever been kidnapped, and only one volunteer has died in an incident of civil unrest." She worries I will be trampled by an elephant like the Peace Corps volunteer in Africa. Yes, she knows there aren't elephants in Ukraine. That doesn't matter. Her 25-year-old daughter is leaving for a scary place, and she doesn't like it. Not one bit. Neither does my boyfriend, who offered me what he thought was the ultimate deal to stay: the privilege of driving his 1974 GTO. I passed up the keys for a different kind of adventure. It all begins in Chicago where I will get six shots I am promised will "make my arms swell up like watermelons." Then, it is off to Ukraine for a three-month crash course in the culture and language with the 50 strangers who make up my Peace Corps class. We don't know much about what to expect. Sure, they told us we will eat lots of potatoes and beets. Live with a host family for the first three months. Probably catch a few illnesses. I have studied the facts. Ukraine is the largest European country, about the size of Texas. The president's name is Leonid Kuchma. The currency is the hryvnya. The national football (soccer) team is Dynamo Kyiv. I know to take off my shoes when I enter someone's home in Ukraine. Don't give flowers in even numbers because it is bad luck. Like my parents, I am worried. Just not about the same kinds of things. It is what I might miss that bothers me. Will my sister forgive me for missing her much-anticipated college graduation? Will my boyfriend, who happens to be a charming and talented lawyer, be married when I get back? Worst of all, my 1-year-old nephew won't remember me. Not even our camel ride at the county fair, a child expert told me. But Peace Corps is a dream I have had for too long to pass up now. So besides the hat, I bought an orange whistle with a compass on it so I will always know which direction west is. Maybe that way, home won't seem so far away. Christie Appelhanz's column from the Ukraine will appear each month in Prosper. hey ukraine isnt that bad i was born and raised there and then i came to the US..so u have no fear. I am so sorry tosee the system has fallen into disrepair. 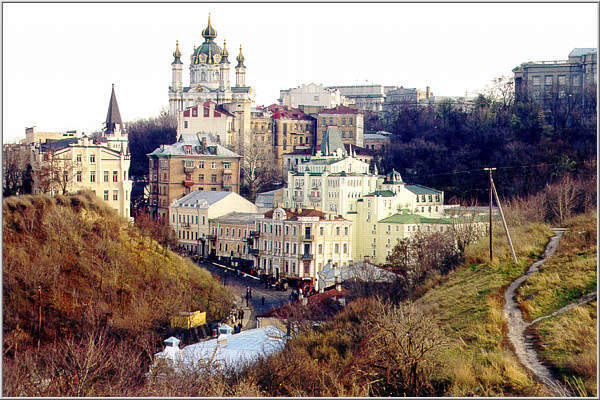 I have been to the Ukraine 5 times, married a 49 year old woman from Lviv in 2006. She got her Visa in January, 2009 in left 3 months later. BUT, I have found a 55 year old woman Doctor who is real and I will visit her soon even though I made a mistake before. I have read hundreds of profiles from Ukraine women amd American women and American women are Want Want, I am, I am. There is no compaision, Ukraine women overall are more cultured, educated, dress better, and care about basics more than American women. There are about 10% of Ukraine women who are overweight compaired to 60% of American women. Very little tatoos and piercings. Family values are most important. I have read for dozens of hours about the Ukraine, it's history and culture. I love the architecture and people and probably will retire there in 7 years. They have their problems but they are not screwed up and on a rapid decline like America. I will get involved with the orphanages and elderly who have had a hard life and appreciate anything instead of expecting and demanding everything. Ukrainian's should be proud of their country, their history, and their future. Beautiful music, and women. They are not backward like most Americans think, but then that is just American arrogance.